The so-called Abelian sandpile model has been studied by scientists for more than 30 years to better understand a physical phenomenon called self-organized criticality, which appears in a plethora of real-life situations such as the coordinated firing of brain cells, the spread of forest fires, the distribution of earth quake magnitudes and even in the coordinated behavior of ant colonies. Even though the sandpile model serves as the archetypical model to study self-organized criticality, questions about its characteristics are still open and remain an active field of research. Moritz Lang and Mikhail Shkolnikov from the Institute of Science and Technology Austria (IST Austria) have now discovered a new property of this mathematical model: by adding sand grains in a specific manner to the sandpile, they induce dynamics reminiscent of the emergence, movement, collision and disappearance of sand dunes in the Gobi or the Namib desert. Different to real-world sand dunes, however, the dunes in their work—which is published in the current issue of PNAS—are composed of self-similar fractal patterns, somewhat similar to the famous Mandelbrot set. The rules of the “sandpile experiment” are fairly simple: The model essentially consist of a grid of quadratic fields, similar to a checkerboard, onto which sand grains are dropped randomly. Fields that end up with less than four grains of sand remain stable, but when more grains accumulate on a field, the field becomes unstable and “topples”. In such a “toppling”, four grains of sand are passed on to the four neighboring fields: one to the top, one to the bottom, one to the left, and one to the right. This might cause the neighboring fields to also become unstable and topple, which then in turn may cause the next neighbors to topple and so on – an “avalanche” emerges. Similar to real-world avalanches in the Alps, these “sandpile avalanches” have no characteristic size, and it is extremely challenging to predict if the next sand grain will cause a huge avalanche, or nothing at all. While, due to the simplicity of these rules, the sandpile model is regularly used as an easy example in elementary programming courses, it nevertheless displays various mathematical and physical phenomena still unexplained today—despite more than 30 years of extensive research. Among the most fascinating of these phenomena is the appearance of fractal sandpile configurations. These fractal sandpiles are characterized by repetitive and self-similar patterns where the same shapes appear over and over again, but in smaller and smaller versions. The occurrence of these fractal patterns has yet evade any mathematical explanation. 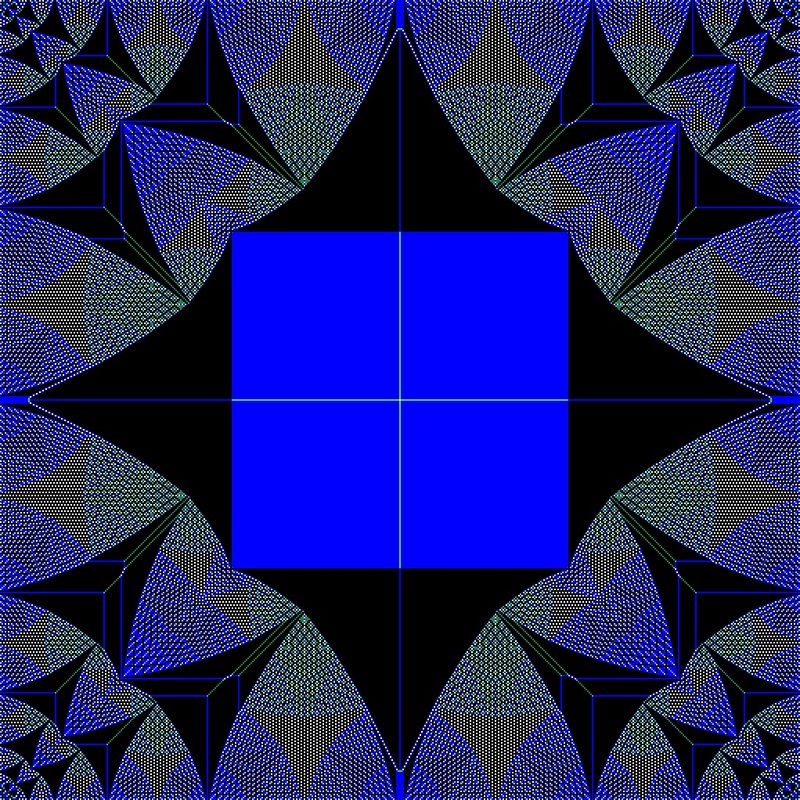 While the researchers at IST Austria could also not solve this mathematical riddle, they rendered this phenomenon even more mysterious by showing that these fractal patterns can seemingly continuously transform into one another: They were able to produce movies in which the fractal patterns display dynamics which are, depending on the background of the observer, either reminiscent of the movement of real-world sand dunes, or of “psychedelic movies” characteristic for the 70’ies. Moritz Lang finished his PhD at ETH Zürich in spring 2015 with a thesis entitled “Modular identification and analysis of biomolecular networks”. He joined IST Austria in August 2015. Mikhail Shkolnikov obtained his PhD from the University of Geneva and joined IST Austria in 2017. The research was completed at IST Austria, and received funding from the ISTFELLOW program, a Marie Skłodowska-Curie COFUND grant co-funded by IST Austria and the European Union through the Horizon 2020 research and innovation programme. This program has since been succeeded by another COFUND grant, the ISTplus program, which is open for applications from qualified postdocs all over the world.